Today we’ll focus on Vembu BDR Suite and the possibility to recover a VM(s) – instantly. Yes, Vembu has Quick VM Recovery feature within their BDR suite. Note that Vembu does not only allow to backup VMware VMs but also Hyper-V VMs or Physical servers. You can quickly recover from those backups by using Vembu HIVE technology. We have already talked about this HIVE file system in my detailed product review here, but since this is quite innovative and basically, it is the core of the system, we’ll touch few words again today. Quick VM recovery (or Instant VM recovery) picks the backups (those are deduplicated and compressed) and boots them on the hypervisor of your choice. You have 3 choices – VMware, Hyper-V or KVM. When mounting the backup, what happens? The system reads the backup data from storage repository and creates immediately the different files. Those files are exposed through the Vembu Virtual Drive. So imagine you have this single console where you manage backups for your virtual and physical environment. After creating the backup job, you’ll find yourself with few backups from which you can restore. But those files, those backups, are not stored on the disk just like that. They are stored in Vembu Database, as chunks, deduplicated and compressed. Those chunks are then exposed through The Vembu virtual drive when you mount them. Those files are created only virtually so no physical storage on Vembu BDR backup server machine is used. 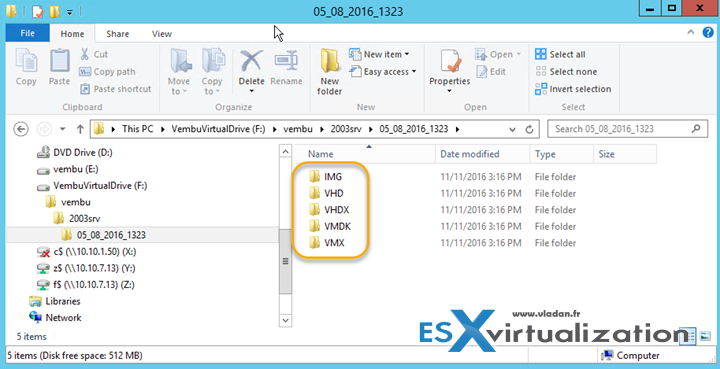 With the virtual VMDK, you can create a VM on ESXi host and point back to the Vembu repository which is exposed as NFS datastore. Similar way you can also expose Hyper-V VM and pick a VHD/VHDX which allows you to create VM on Hyper-V host. Note that there are other file, with extension IMG, and those files can instantly create VMs which are created on KVM Hypervisor. Jut by curiosity, here we have the Explorer window on our Vembu VM. You can see the virtual drive – the different file formats have been created instantly, from backup chunks. No copying around…. Those files are exposed thanks to the Vembu HIVE technology. Vembu HIVE exposes every incremental backup as a virtual full backup. It means that not only that a restoration of a backup will not require a merging of all the changes to a previous full backup, but also that through Vembu Virtual Drive backup files get exposed as VHD, VHDX, VMDK-Flat and RAW image files – at the same time. Let’s check the first option. You’ll be invited to pick up a VM which you want to restore > restore version > and then the restore options. Here we have a choice between VMware and Hyper-V. Let’s pick VMware this time. If we selected Hyper-V, then the options would have been different. After the review screen, you will see almost immediately the success window… You have restored a VM, fast way. What’s quite magical is that you can restore either on VMware ESXi or Hyper-V host (or even KVM) as you have those files at your fingertips. This is not a usual (and common) feature that every backup vendor can show you. Believe me. 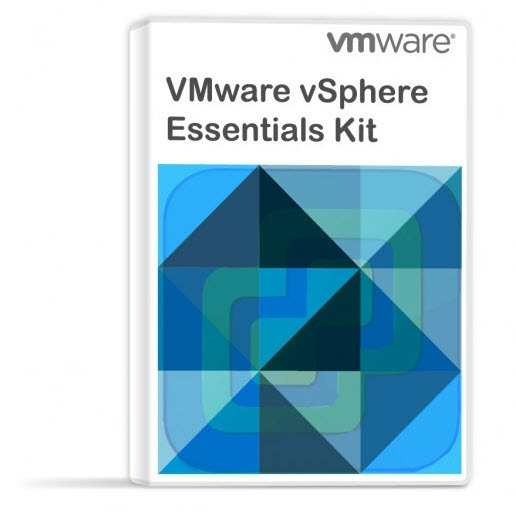 The VM boots up directly from the backup file, but you might ask. What about modifications? Do the modifications alter the backup file? The answer is no. To maintain the integrity of the backup data, all the modifications after booting a VM are stored in a separate virtual hard disk file. You have several options to install Vembu BDR and as a result, you’ll also have different options for recovery. Option 1: Installation on Physical Windows system – You can simply enable Hyper-V or KVM role and you can use this server to instantly recover VMs from backups which lay on that particular server. You can also recover backups of physical machines and have them boot up as VMs. Option 2: Installation inside a Windows VM (our lab case) – You can share the Vembu virtual drive by mounting via NFS, OR by using SMB share and do Instant Recovery of VMs (or physical machines) on any Hyper-V server running in your IT environment. Vembu is an agent-less solution for VMware. It uses Changes block tracking (CBT) technology to find out which blocks has been changed since the first full backup. Then the software only does a backup of the blocks that changed since the last backup.